Featuring Angela — A Bloggers’ Quilt Festival Quilter! Today’s featured quilter is Angela! Angela is a local friend, I’ve had the pleasure to meet, and I’m so excited to share her story and quilts with you. Enjoy! 2 1/2 years ago, I was pregnant for the first time. I found myself really wanting a special quilt for my daughter. I looked around for a pattern, hoping my mom could make a quilt, yet nothing really jumped out at me. My hubby and I decided that we wanted a Charley Harper theme for her bedroom, and so that became the inspiration behind the quilt I knew I wanted for her room. I took an applique class at a local store and from there I designed and created my very first quilt. I’ve been quilting ever since. Sewing is therapy to me, for some reason –my hands are busy, and it seems when my hands are busy my mind is just a little quieter. I also love to create, and so ideas are always coming to me. I guess quilting and sewing are my outlet for my nervous energy and creative ideas. Try something different! Every time I make a new quilt, I always try something new. A new skill, a new shape, a new color palette, or something completely wacky like my interactive play quilts. I find this is where I learn the most, and so I encourage others to do the same. I made a series of Interactive Play Quilts and the Americana Appliqué Scenes was by far my favorite. I was born in 1980, and the baby blanket I had was made up of bold primary colors, no pastels: red, blue, navy, white, yellow, and green made up the quilt. These colors were very popular in my childhood, and I find myself still loving them today. Along with that, the applique scenes in this quilt were also inspired from my childhood. 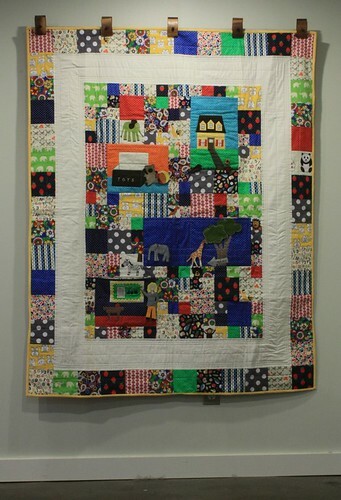 My favorite memories inspired the scenes in this quilt: playing in the front yard, going to the zoo, playing “school” with my sister, along with all the other toys we had. When making this quilt, really it was just a walk through my childhood. Yes, I love sewing things for both my home and for my family. I create unique fabric wall art pieces, using turned edge machine applique techniques. I also love sewing pillows, handbags, items for the kitchen, and things for my 2 year old daughter. Thanks for sharing your quilts with us Angela! I espcially love this one above for your daughter, with the album- so precious! I hope you all have a great weekend! I’m headed to Sisters, Oregon for a fast weekend full of quilts – don’t worry, I’m taking my camera!! Thanks for sharing Angela with us. I love the interactive quilts! Wow! Some beautiful and unique quilts from Angela! Thanks for sharing. I am in love with your quilts!! Beautiful! I really love the quilt with the house and toy chest….genius! Hopefully I can quilt that well one day. Thanks for sharing and all the tips! 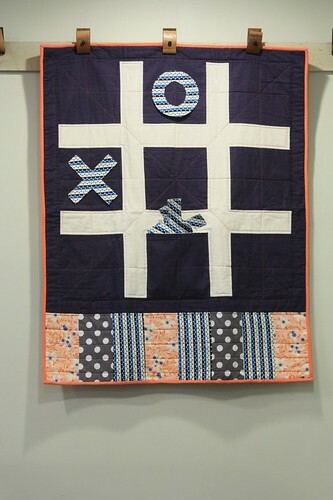 Love your quilts…so creative. Thanks for the inspiration Angela! Thanks for bringing us these posts – I enjoy reading them and looking at the quilts. That purple one is fabulous! Thank you for introducing us to Amy and her beautiful quilts!! Lucky you! Thanks for sharing and enjoy your weekend! GREAT quilts! Love the butterflies and the interactive quilt. Enjoy Sisters, Amy! Thanks for the feature Amy, I really appreciate the nice post. And thanks to everyone for all their nice comments –I’m blushing! Very nice quilts Angela. The butterfly quilt is awesome. I totally agree with you, quilting is a great form of therapy. Wow Amy! 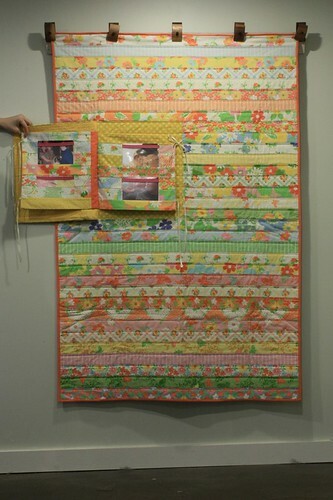 Angela has a really creative spin on quilting, thank-you for the heads up on her work! I am very very impressed with the butterfly and several other designs. What great pieces of artwork these are. I cannot do this. Beautiful quilts Angela. I love the stips with the photo album. And the purple diamond pattern- I can imagine one in that pattern , and my colours , on my living room wall. Thanks for sharing. My first comment got lost. Ok.
Beautiful quilts Angela. I love the stipe one with the photo album. And the purple diamonds is a great pattern. I would like to try one for my livingroom wall ( in my colours). Thank you for sharing. Great quilts by Angela! I feel lucky to have met her this year too. Here’s to hoping to see more of Angela in the future! !